The Customer information module is where you enter the information as you wish it to appear on your contracts. The last name box expands if you continue typing to allow for long names such as companies and corporations. You may also enter information and run a Credit Report by selecting Report from the Menu above. Is is very important that you do not enter the street description such as St. Ave. or Blvd. for the credit report. You can recall a customer from your files into the Customer information module directly by typing the name or selecting from the file box displayed when you choose Recall from the File Menu. When the file is opened you can click the << >> keys to see the different files and choose Keep to add the information to your current deal. 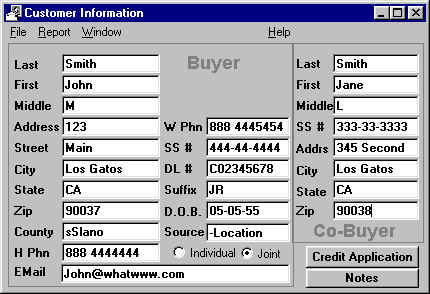 When entering a composed name you may use alternate systems, for example: if your customer’s name is J. Tom Smith you may put J. Tom as the first name and Smith as the last name and skip the middle initial , you may have to experiment when running credit reports since it may show different credit under J.T. Smith. Remember the last name is also the File name, try to avoid characters that may confuse the system when recalling a customer. Lease Master continues to take the first consecutive 8 characters to create a file name.